Background: Most concerns about the need for jawline augmentation are focused on the horizontal and width dimensions. 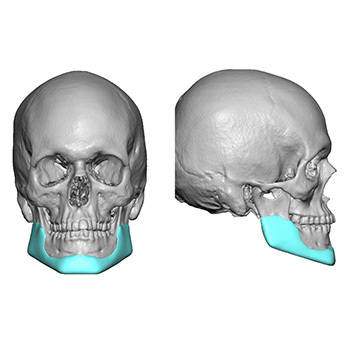 Making the lower jaw more prominent is done by this 2D approach. 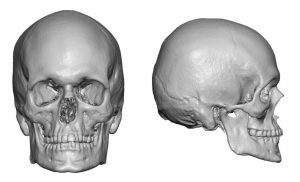 The main need for adding verticality to the jawline is most commonly done in the posterior jaw angles where a high mandibular plane angle has created a steep jawline from the ear to the chin. But the reverse of a high mandibular plane angle is that of a flat mandibular plane angle. In this jaw shape the vertical length of the jaw angles is adequate but the chin is aesthetically vertically short. This creates need to drop the chin down as well as the jawline behind it back to the existing jaw angle corner. When the chin is vertically short there are two methods to lengthen it. It can be done by an opening wedge bony genioplasty or an implant can be added onto the bottom of it. For the sake of a smooth and linear jawline behind the chin only an implant can provide that effect. Case Study: This young male desired a complete jawline augmentation that lengthened his chin but widened his jaw angles. His 3D CT scan showed a flatter mandible plane angle although not one that was completely flat. 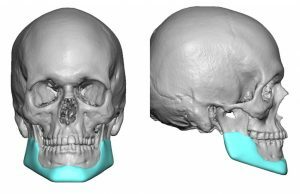 Using his 3D CT scan a custom jawline implant was deigned that added significant vertical chin length but no vertical jaw angle length. This created a more steep mandibular plane angle. Modest jaw angle and chin width was also added. Under general anesthesia and through a three incisional insertion approach (paired intraoral and one submental), the custom jawline implant was placed. It was done in a front to back technique keeping the implant intact as a single piece. 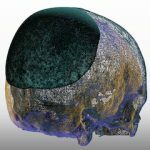 The most relevant part of its placement was whether the soft tissue chin pad could be pulled over the vertically lengthened chin part of the implant. It did so satisfactorily, meaning they actual pad rotated over the inferior edge of the implant. 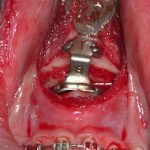 There are limits as to how much the soft tissue chin pad can be detached from the bone and then pulled over an implant that drops the inferior border down. In my experience that limit is around 7 to 8mms. If the chin pad is not elastic enough to stretch over the lowered inferior chin border a double bubble or double roll effect will occur. This will be most evident in the side view where the implant edge is the lower border and the bulk of the soft tissue chin pad sits anterior to it. 1) Lower jaws with a more flat mandibular plane angle need vertical chin and jawline lengthening. 2) The soft tissue limitations for implant lengthening are in the anterior chin area with the tighter soft tissue chin pad. 3) Only a custom implant design can add length along the entire lower border of the jawline.